Please help me maximize our travel in Hongkong. We will arrive on the 06th of June 2011 at around 9:55am and stay at Dorsett Seaview Hotel in Yau Ma Tei. Its a package tour from travel agency. 1st day from airport is our free time. 2nd day city tour and Disneyland. But the place I want to go is not included in the city tour. 3rd and 4th day Macau. Please help us maximize our trip. Is it possible to go to ocean park + Victoria peak + Avenue of Stars in day 1? Or, is it better to go to Ngong Ping + Victoria peak + Avenue of Stars? Whats the best itenerary from hk airport? Im arriving at 8am in hongkong, my hotel check is at 2pm. I want to maximize my time since im just staying for 2 nights in hongkong and leave on a flirst flight on the 3rd day? hi! help pls..we'll be arriving in HK on aug17 9pm. then aug18-whole day disney tour, aug18-macau tour. my prob is for Aug 19 itinerary. Is it possible to visit Ngong Ping, Ocean Park, and Victoria peak in 1day?ls help. i dont mind staying for short period only in those places. Also, can we have a good view of the symphony of lights at 8pm from the Peak? please give me best advice itinerary for each day in 4 days. details on what bus/mtr/taxi to ride, how much will it cost, how much octopus card will i buy. how much will i cost for the tourist spots. please give me details on how to get here from silka seaview hotel. please indicate the what bus and trains should we ride. thanks! and the possible rates. thank you! Getting to Ocean Park from Rambler Hotel, please Click Here. Please refer to the above post dated May 26, 2011 on how to get to the Peak from Ocean Park and to the Avenue of Stars & Symphony of Lights from the Peak. I suppose you mean you're staying at Victoria Road which is a main road near the west shore of Hong Kong Island in Hong Kong connecting Kennedy Town. Here's how to get to The Peak (where you can also visit Madame Tussauds Hong Kong) from Victoria Road. Just take a taxi straight to the Lower Peak Tram Terminal (about 13 mins @ HK$50) and then take the Peak Tram up to the Peak (HK$40 - round trip ticket). Once at the Peak, you can get into Madame Tussauds (ticket price @ HK$165, HK$95 for Child aged between 3 - 11 and Senior aged 65 or above). Getting to Hong Kong Disneyland from Victoria Road. Take a taxi straight to the MTR station, Hong Kong station (about 12 mins @ HK$45) --> get into the Hong Kong subway station --> take the Tung Chung Line train and get off at Sunny Bay station --> interchange trains to the Disneyland Resort Line that will get you straight to Disneyland station and then take Exit A (29 mins @ HK$21.7) --> walk about 3 minutes to the park main entrance. sir can u help us to organise our trip to hong kong. we will stay at Victoria road then want to visit peak, disney land, madam Tussauds, our trip is for 4 days. Actually, there is a bus route (bus no. 15) that you can take at Man Kwong Street outside Central Pier no.5 up to The Peak (118 Peak Road inside Peak Galleria) but note that the Peak Tram is a must-try thrilling ride in HK. The bus journey time is 35 mins approx @ HK$9.8. Yes, it is doable, you can take Peak Tram up to the Peak @ HK$28 single trip (HK$40 - round trip) and then take the bus in getting back to Central Pier. From Central Pier, get into the Pier no.7 and take the Star Ferry to Tsim Sha Tsui (9 mins @ HK$2.5). So the cheapest way to get to TST from the Peak is definitely by bus no.15 + star ferry but it is a bit time consuming. from the star ferry terminal going to the PEAK, is there a bus ride instead of the peak tram? bus is cheaper transport to the Peak? Or can we ride tram going to the Peak, then bus going down? How much would the tram & the bus cost? from the Peak going to TST avenue of stars, how do we go there the cheapest way? * If going to Ocean Park, it should be Admiralty MTR station Exit B then bus CTB 629 straight to the park entrance. * And if going to the Peak, an option is to go to Central MTR station Exit J2 and then walk about 12 mins to the Peak Tram Lower terminal at Garden Road. Please click here to see map for this route. Thank you so much for your help, lastly, what exit should we go and what bus will take us to garden road peak tram terminus? YES, you can take the MTR Tsuen Wan Line train at Yau Ma Tei and get off at Admiralty station (8 minutes @ HK$9.9). 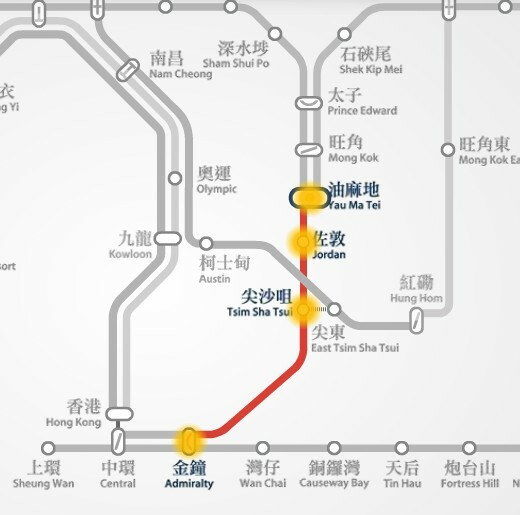 See MTR route map below. OH. thank you very much advise, can we just go straight to admiralty station from yau ma tei station? Silka seaview hotel is located at 268 Shanghai Street, Yaumatei, Kowloon, Hong Kong. About 3 minutes walk to the Yau Ma Tei MTR station Exit C.
To read more details about Silka seaview hotel and getting to some HK popular tourist attractions, please click here. I assume that you're referring to Wong Tai Sin Temple which is located in the northern side of Lion Rock in the north of Kowloon and easily accessible thru Wong Tai Sin MTR station Exit B in Kwun Tong Line trains. The driving distance between the two location mentioned above is about 8 km @ 16 minutes drive. Definitely not a walking distance! The shuttle bus route is from hotel to Kowloon station which is a free service provided only for Airport Express passengers. Get into the Yau Ma Tei MTR station --> take the Kwun Tong Line and get off at Wong Tai Sin station Exit B (12 minutes @ HK$5.6) --> take a short walk and follow directional signs to the Wong Tai Sin Temple. Get into the Yau Ma Tei MTR station --> take the Tsuen Wan Line train and get off at Tsim Sha Tsui station Exit F (train travel time is 5 minutes @ HK$3.8) --> walk to the nearby TST Star Ferry Pier --> take the Star Ferry to Central (9 minutes @ HK$2.5) --> walk to the nearby Central Pier Bus terminus --> take the bus 15C to the Peak Tram Lower terminal (10 minutes @ HK$4.2) --> take the Tram up to the Peak (HK$40 - round trip ticket). Once at the Peak, you can visit the Madame Tussauds Hong Kong. Please help me enjoy our trip. from hotel Silka seaview,can we walk to wong sin temple? or it is near in Silka Kowloon, we can use hotel shuttle to Silka Kowloon. how far it is, if we walk? and from Silka seaview hotel how can we go to Madame Tussauds, i don't know how to go to peak tram terminus. can you help me? Me & my husband will be staying at the same hotel this August and we have the same itinerary Ocean Park + The Peak + Avenue of the Stars (for 1 whole day). Just wanna say that your advise is very comprehensive and very helpful. Thank you very much for taking some time to help. Take the Peak Tram again back to the Garden Road Lower Peak Tram Station then walk in the nearby Peak Tram Bus Terminus. Get on the bus 15C for about 10 minutes ride to Central Pier Bus Terminus @ HK$4.2 then take a short walk to the Central Pier 7. Board on the Star Ferry to Tsim Sha Tsui Ferry Terminal for a very scenic view at the Victoria Harbour for 9 minutes @ HK$2.5. Walk along the TST promenade to get into the Avenue of stars and stay there to watch the Symphony of Lights that starts every 8:00pm. Actually after the show, you still have time to do street market shopping like the Ladies' Market which is close to your hotel and open until midnight. Getting to Ngong Ping from Kowloon area can be read in here. Getting to the Peak from Ngong Ping or vice versa, please click here. * HONGKONG-MACAU TRIP (first timers) ITINERARY 2011 (4 full days) kindly suggest and advice re transportation. Hope this help and have a wonderful trip to HK! I assume that you only want an itinerary in your first day in Hong Kong and the rest is prepared by your travel agency. Definitely, Ocean Park is way better than Ngong Ping 360 though Ngong Ping is a place to go if you want to experience some adventure in HK. Dorsett Seaview Hotel is located at 268 Shanghai Street, Yau Ma Tei Kowloon, Hong Kong. Walking distance from the Yau Ma Tei MTR station Exit C.
Dorsett Seaview Hotel location map, showing the nearby MTR exit. Walk to the nearby Yau Ma Tei MTR station. Take the Tsuen Wan Line trains heading to Central station but you need to get off at Admiralty station then take Exit B, 8 minutes @ HK$9.7. Upon exit, you'll find the Admiralty (west) Bus Terminus, take the express bus CTB no. 629 straight to Ocean Park entrance for about 25 minutes @ HK$10.6. Take same bus no. 629 back to Admiralty MTR station. From admiralty station, I suggest you take a taxi to the Lower Peak Tram Terminus at Garden road to save your time from long walks, about 10 minutes drive @ HK$30. Then take the Peak Tram straight to the Peak, 7 minutes breathtaking tram ride @ HK$36 (round trip Tram ticket).